Heat oven to 400°F. Line cookie sheet with cooking parchment paper or silicone baking mat. Shred chicken to make about 4 cups; discard bones and skin. In large bowl, toss chicken, cheese, onion, cilantro, cumin, chili powder, oregano and green chiles. Over gas burner or in skillet, heat tortillas until warm and pliable. Wrap tortillas in kitchen towel to keep warm. Working with 1 tortilla at a time, spoon about 2 tablespoons chicken mixture onto one side of tortilla. Wrap tortilla over filling and roll up. Place taquito seam side down on cookie sheet, gently pressing flat with palm of hand if needed to make sure taquito does not roll around. Repeat with remaining tortillas and chicken mixture, making sure to leave a bit of space between taquitos so they crisp nicely during baking. Brush tops of taquitos lightly with oil. Bake in center of oven 25 minutes, rotating pan once about halfway through baking. Meanwhile, cut avocado in half; remove pit. With spoon, scoop avocado flesh from shell into large bowl. With back of fork, mash avocado well. Fold in yogurt, lime juice and salt until thoroughly combined. 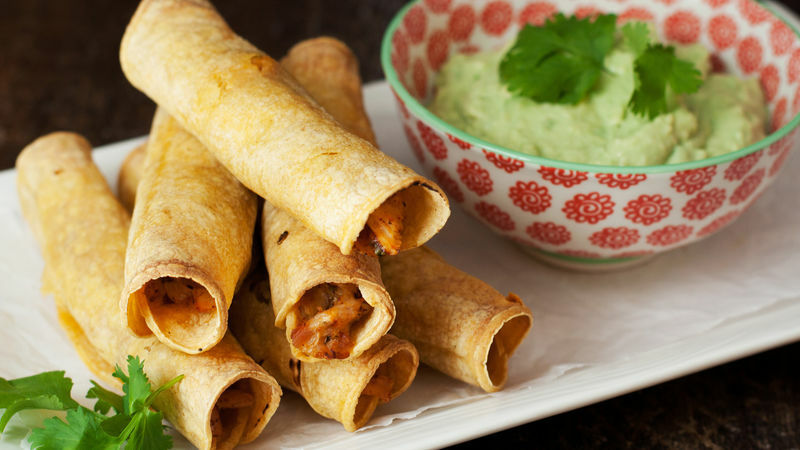 Serve warm taquitos with dip. Freeze unbaked taquitos in a single layer on a cookie sheet until frozen solid. Remove them from the cookie sheet and place in a resealable freezer plastic bag. Freeze for up to 2 months. When ready to serve, bake frozen taquitos 2 to 3 minutes longer. Warming the corn tortillas and wrapping them in a towel before rolling makes them soft and pliable, ensuring that the tortillas won’t crack when rolled. You might like to try Yoplait® yogurt in this creamy avocado dip to serve on the taquitos.